Designed to meet the diverse needs of both R&D laboratories and quality assurance environments, this new generation of universal testing machines offers enhanced performance and capability making it ideal for both Product and Materials testing applications alike up to a capacity of 5kN. The mechanical construction of the frame and drive system offers excellent rigidity with negligible frame deflection. 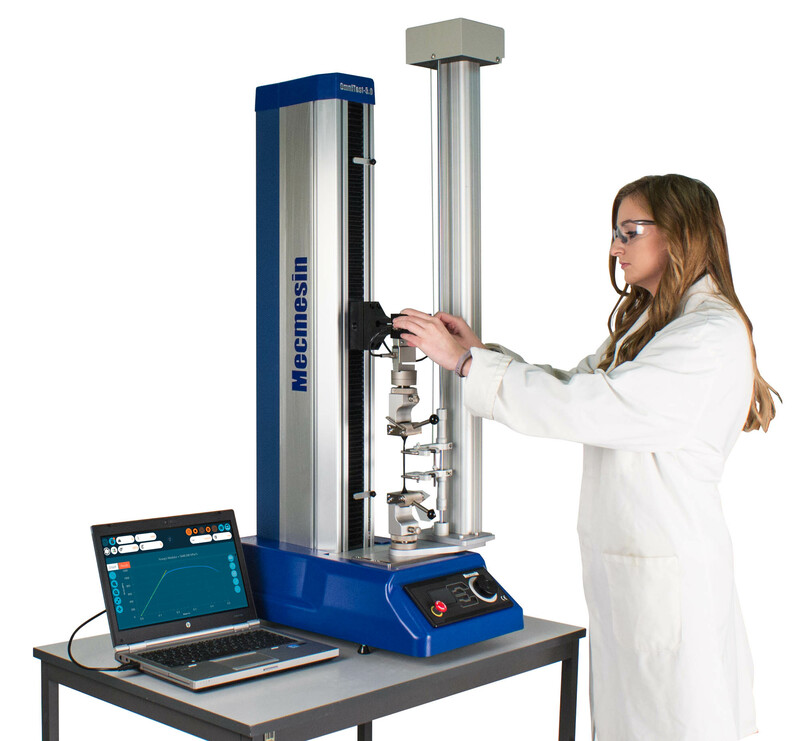 The OmniTest-5.0™ frame takes up a relatively small bench space has an integrated cable management system and extended throat depth for testing of samples up to 200mm in diameter. The OmniTest-5.0™ has a simple-to-use front panel for selection of test parameters live load and length readings and precise manual crosshead positioning using the multifunction controller. Mecmesin’s new generation of electronics gives active load control and improved motor performance giving a speed range from 0.01 mm/min to 1200 mm/min with a positional resolution of 0.001 mm. The OmniTest-5.0™ incorporates state of the art electronics and a new Enhanced Load Sensor (ELS). Load accuracy is 0.5% rdg with a resolution of 1:25000 allowing a wider range of tests to be performed without the need to select a different load sensor. Flexible, reliable, and offering excellent value for money, the OmniTest-5.0™ is supplied with Mecmesin’s new VectorPro™ MT material analysis software enabling testing to many internationally recognised standards to be carried out. The system can be supplied with or without an extensometer depending on the customer’s actual testing requirement. Powerful, intuitive and touch screen friendly, Vector Pro™ MT has been designed with ease of use at the forefront through an intuitive drag & drop test builder, icon driven graphing tools and highly configurable reporting options. VectorPro™ MT is built around a database that logs user permissions, test parameters, test versions and results. This database architecture provides an audit trail and e-signature functionality delivering compliance with 21 CFR Part 11 requirements. The OmniTest-5.0 can test a wide range of materials, including metals, polymers, composites, fabrics, glass and ceramics using the extensive selection of grips and fixtures, around which Mecmesin’s renowned application solving capability is based. Mecmesin Ltd Managing Director John Page said: “We are delighted to be able to introduce the OmniTest-5.0 + VectorPro™ MT at the Control 2017 Exhibition, it delivers many of the features and functionality that we have been consistently asked for by our customers over a number of years. This new product is the first of many that will benefit from the new hardware /software technology platform we have developed and so announces a new exciting chapter for the Mecmesin Group.